As ANNUITAS is now running the 2015 version of their B2B Enterprise Demand Generation Survey online, I decided to analyse the 2014 version, first to give you my impression about the 2014 survey’s results, but also to be ready to compare this with the upcoming study. For those who wouldn’t know about ANNUITAS, this is a B2B Demand Generation Strategy based in the US in Atlanta (HQ), Boston and SF. On their homepage they describe themselves as a team of passionate B2B marketers, technologists and strategists that thrive on helping clients drive perpetual revenue through an integrated and holistic demand generation strategy. First of all I think this is important to precise that this study only exceeded $250M in annual revenue, which is not so common for such studies, as SMB are very often taken into account. 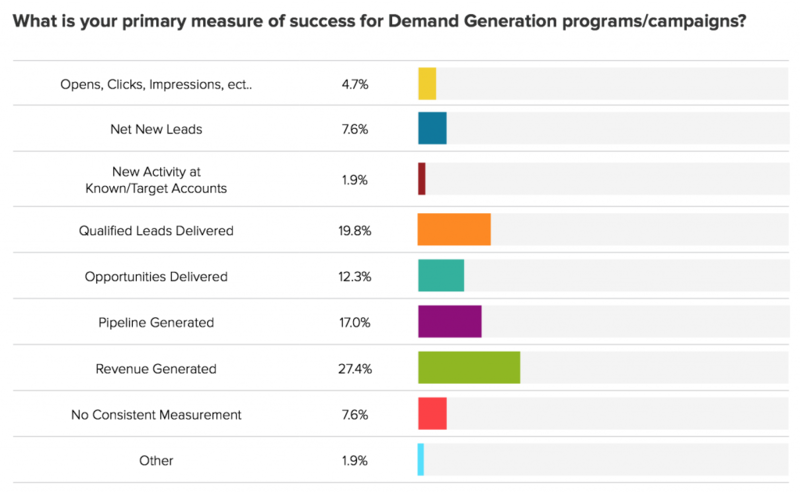 By the way, before I start, if you don’t feel so comfortable with the concept of Demand Generation, I like the definition that HubSpot give on their on their blog. The first element that struck me is the wording of the first question: “How many Demand Generation programs/campaigns do you run on an annual basis?”. I must admit that I am a little bit surprised that the concepts of marketing programs and marketing campaigns are not differentiated here. 60% of the B2B marketers declared that they performed more than 15 marketing programs/campaigns in a year, but IMHO this number doesn’t mean much as far as we don’t differentiate “marketing campaign” from “marketing program”. E.g. You can create a marketing program aimed at reinforcing your new business generation, which will be supported by a series of dedicated campaigns: a cross-selling campaign (trigger marketing via your marketing automation tool), a worldwide telemarketing prospection campaign, a online advertisement campaign (LinkedIn pay-per-click) and so on. So the conclusion should be that B2B marketers focused more on quantity and quality, but that they don’t perceive the difference between a campaign and a program. I really don’t blame people who massively answered “revenue generated”, but this is not true. The role of B2B marketers is not to convert opportunities to business revenue, but to generate qualified leads and actively contribute to a conversion into a realistic and tangible business opportunity. I understand that people came to answer this question to please their management, but every stakeholders involved in the marketing & sales process should stay in his role. E-CRM platform like Salesforce or Microsoft Dynamics (the only ones I used so far) have their own language. This language influences a lot the communication between Sales & Marketing. Why? Because e-CRMs are initially more or less marketing, more or less sales. We shouldn’t base our communication with Sales on Salesforce’s terminology! Salesforce was initially very much B2C (which I can feel every day as a B2B user) while Microsoft Dynamics has been designed for B2B (opportunity management and key account management features are awesome). What is a contact? What is a lead? What is an opportunity? This is where the misunderstanding stands, not on the technical use of those platforms. The technical barrier could have been an argument 20 years ago, when all of this was new-age. But now, even the smallest company in the world is using somehow CRM systems to store their commercial data. “The impact of digital to an organisation is top to bottom – from strategy to customer engagement, operations, risk and tax. Digital should therefore be everyone’s job. If the role of the CDO is to incubate and infuse digital thinking and new ways of working across the company then the mark of success should be when the role is no longer needed.” Laurence Buchanan. “How will your spend on content marketing compare to last year?” 30% of “will decrease” or “will stay the same”: I would blame this. It reveals that it is still unclear how to build a consistent content marketing strategy, how to develop a internal contributors’ network and how to spread the word externally. Corporate Marketing can’t do content marketing on his own. Operational Marketing drives Content Marketing with the support of Product Marketing and Sales. I skipped the lead nurturing part, as it sounds too logical to all of us than gathering existing information about non active contacts is the basis of cross-selling. However I think this is worth it to focus on ANNUITAS conclusion. I am truly surprised that Pardot is only used by 5,7% of the respondents, while Marketo et Eloqua share 50% of the market. I discovered Pardot in 2010 in my former company, and totally fell in love with this solution, before it was acquired by Salesforce. I remember them to be Salesforce partners already though, it seems that they were just paving the way to the success. Marketo & Eloqua’s sales and marketing force might be one of the explanations, but as far I as Pardot is now recommended by Salesforce itself I can hardly believe that this solution don’t manage to get a bigger part of the market shares. While I am writing I discover the proportion the industry breakdown of the study, which particularly concerns me: almost 37% of the respondents come from the Technology/High Tech/Software industries, with 80% of them coming from pure B2B pure-players. This is me then. I am looking forward to hearing your comments and thoughts about all this!